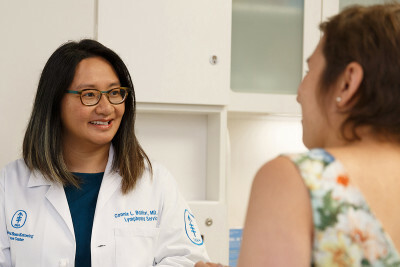 MSK experts such as medical oncologist Connie Batlevi treat lymphoma with a variety of techniques while managing symptoms of the disease and its treatments. The most common early symptom of lymphoma is painless swelling of one or more lymph nodes, typically in your neck, armpits, or groin. Many of these symptoms may be related to other conditions. For example, it’s normal for your lymph nodes to become swollen or enlarged when you’re fighting off a viral or bacterial infection. But if they stay swollen for long periods or become enlarged for no apparent reason, it may be a sign of lymphoma. Anyone with persistent symptoms should see a doctor. Read more about how lymphoma is diagnosed.